Structural jacking and bracing for your home. Are your floors sloping? Do your doors close incorrectly? Are there plaster or drywall cracks developing in upper walls? Perhaps your home may need beam replacement via structural jacking, and could be the answer to your problems. We can replace old, deteriorated wood beams with new high strength steel beams or pressure treated wood, and jack your floor back to a level position. Preservation work often includes structural jacking to repair an old foundation. Contact us to have your home Jacked Up. What we are really doing, is stabilizing your foundation to ensure the structural integrity. Give us a call at 585-338-9865. Constant exposure to soil pressure and water can damage your foundation if it was not properly constructed. Buckled, bowed, or cracked foundation walls. Cracks in exterior walls or interior walls and ceilings. Doors and windows that are “sticky” or difficult to open and close. Remodeling or opening up a space? Is there a load bearing wall in the way? Top to Bottom can remove that load bearing wall and replace it with a properly engineered beam and supporting columns. 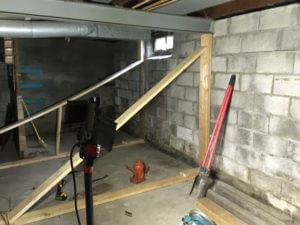 Top to Bottom can stabilize, realign or replace your home’s foundation walls. If damage is extensive, and a foundation must be completely replaced, the experts at Top To Bottom can handle every step of the process. Basements/attics transformed into “Super Spaces”.